Distinguished Professor Saad El-Zanati introduces math research to Chicago high school students at his summer camp. In the summer of 2013, Jesse Williams left Chicago to spend a week in Normal. Those five days at Illinois State’s Math Research Camp transformed his life. Williams had arrived at the camp with little confidence in his math skills. He left Normal realizing he had been limiting himself. Last May, Williams earned his degree in mathematics education from Illinois State. He is now pursuing a master’s degree in bioinformatics. Williams is one of dozens of Chicago public school students who have participated in the math camp led by Distinguished Professor Saad El-Zanati. Each July, El-Zanati welcomes 12 to 18 of these teenagers to campus for a week dedicated to examining and finding solutions to original research problems in discrete mathematics. 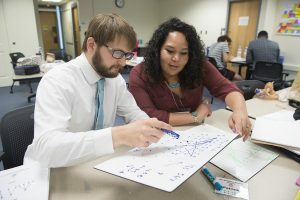 The students research under the tutelage of professors in the Department of Mathematics, and a group of current and aspiring secondary math teachers. High school teachers from throughout the country come to ISU every summer to participate in a math research program. The camp evolved out of another summer research program started by El-Zanati: the Research Experiences for Pre-Service and In-Service Secondary Mathematics Teachers. The programs share a symbiotic relationship, and both are largely funded by the National Science Foundation (NSF). Illinois State’s program is the only one out of about 50 NSF-funded Research Experiences for Undergraduates (REU) programs nationwide that focuses exclusively on future and practicing teachers. The REU participants immediately apply what they have learned about math research by helping oversee the high school camp. 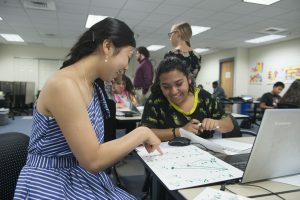 For much of the rest of their program, the REU participants work in teams to develop solutions and prepare papers for publication in peer-reviewed research journals based on discrete math problems presented by the professor and his colleagues. For the high school students, the REU participants take a few hours that first day of camp to explain the math research problem. By the end of the second day, the students are huddled around tables inside a classroom in Turner Hall, talking over different aspects of the problem, sketching graphs on dry-erase boards, and peering into computers as the REU educators circulate from group to group. Discrete math deals with finite, countable quantities and covers graph theory, among other areas. Unsolved problems are an equalizer for students, said Teddy Schrishuhn ’09, who studied under El-Zanati at Illinois State. Schrishuhn has brought a group of his Pritzker College Prep students to the research camp the last three years. Chicago high school students get the opportunity to dive into math research each summer as part of Distinguished Professor Saad El-Zanati’s camp. The programs promote collaboration and tear down preconceptions students may have about themselves. That was certainly the case for Cody Hatzer, a senior math education major at Illinois State. He received the Bonnie H. Litwiller Scholarship in Mathematics Education last summer to participate in the REU program. Hatzer realized he didn’t need to be a “brainiac” to do math research. His biggest takeaway from the camp was that high school students can do this type of research as well. That’s a lesson El-Zanati instills every summer in his aspiring math researchers.